Deep rose-pink anemone form flowers, occasionally semi-double. The vigorous, long, arching growth makes this an excellent variety for training against a wall. Bronze-coloured young foliage. Prolific flowering late in the season (end of March to early May). Deep rose pink anemone form flower. Very free flowering. Long arching growth which makes it ideal for training against a wall. Bronze young foliage. Late season flowering. Rhododendrons and Camillia we purchased were very good quality and quick service well packed liked that we could track parcel would recommend Trehane nursery . Our camellia arrived by courier. It had been superbly packed in a protective box with the plant pot covered to prevent any loss of soil, and the plant & pot securely tied to hold everything firm. The plant itself was obviously of a good quality, and with flowers already opened and more to come. This is clearly a company that cares about its products and its customers. 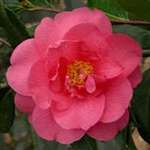 All four camellias received were very well packed and so arrived in pristine condition. They are all excellent quality plants with lots of very promising buds which I am looking forward to seeing open. An excellent service all round from Trehane - I thoroughly recommend this company.